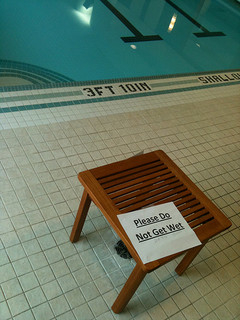 I am often asked what are the most annoying problems you can have with pools. My answer is always BAD DRAINAGE!! When we install a pool, we spend a good amount of time assessing the grade of the ground and confirming the level of the pool and patio. There is a reason for this: water only runs downhill and we want it to get to a spot where it will do no harm and will not annoy. If water runs into your basement or into the pool cavity, a LOT of damage can occur. We need to control how that water flows in a 3 hour, 3" rain (and that can be thousands of gallons!!!). Strip drains: are troughs basically, that can handle a large volume of off flow. French drains use a long, narrow grate, collecting water underground and funneling it elsewhere. They can be constructed to surround the deck and blend in with the deck floor. 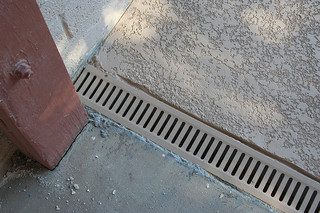 Spot drains: are smaller drains placed in strategic places; they feed into a horizontal pipe that carries water from the patio. Spot drains are used in places where strip drains won’t work. The combination: grades and drains. Another possibility is to create a valley at a specific place on your deck and place a drain at its center. This can be an effective way to slope water away from the pool and house. These efforts divert water but it still needs to be removed from the yard. Where is the nearest storm sewer or area drain? Where does rainwater naturally flow? Once the answer is determined, now the question is how to plan the route to get water to its desired location. French and spot drains carry the water down from the surface. Regardless of where you’ve positioned them, they need to be attached to a drainpipe, to carry the water across the yard to its outflow point, like a storm sewer. Set up properly, drains will operate self-sufficiently by gravity. Large amounts of water flowing through (like after a rainstorm) clean the drain and will flush debris through. But sometimes a drain needs a little more pressure to clean it out. The first thing to do to clean out a strip drain is to remove the grate cover and grab any leaves and debris blocking the drain entrance. If it is still blocked, tough hosing might be needed to unclog the drain. Talk to your pool contractor about the best way for you to clean the drain, given the way it is being constructed. So the basics are: have a workable drainage plan that only involves water FLOWING DOWNHILL, implement it and then MAINTAIN IT OVER TIME. Miss only one of these steps and you may have consequences you don't want!! What else should you talk to you contractor about when it comes to maintenance? Download our free checklist, Choosing the Right Pool, Options and Builder for a quick reference.